Hortense Eugènie Cécile de Beauharnais was born on the 10th of April 1783 in Paris, the second child and only daughter of Alexandre and Rose (now better known as Joséphine) de Beauharnais. At the time of her birth, her parent’s marriage was all but over and her premature birth was used by Alexandre’s vindictive mistress, Laure de Longpré, to persuade him that he was most likely not even her father. From this point onwards the hypocritical Alexandre stoked up his campaign to tarnish his wife’s reputation and she was forced to take up residence in the convent of Panthémont in the Faubourg St Germain, which acted as both a school for aristocratic girls and a refuge for wealthy ladies, who were able to live there unmolested with their children. Things between the couple came to a head in 1785 when Alexandre kidnapped his son Eugène from the convent and Joséphine was forced to legal action to get her boy back. The resulting settlement forced Alexandre to drop his allegations about Hortense’s paternity and her childhood thereafter was pleasant enough with two years spent in Martinique with her mother. The reason I dwell a little on this is that these events early in Hortense’s life must have influenced her because later in life she was devoted to her mother and readily gave up her own desires to comply with her mother’s wishes. When Revolution swept through France, Alexandre eventually came under suspicion and, following his failure to defend Mainz during the siege of 1793, he was imprisoned. Joséphine followed him into imprisonment a month later; Hortense and her brother were left in the care of a devoted governess. Alexandre de Beauharnais was guillotined in July 1794. It looked like Joséphine would follow him but the coup of Thermidor put a stop to the Terror and she was eventually freed in August 1794. Relieved to be alive, Joséphine now threw herself into the fashionable life that had sprung up in Paris after the fall of Robespierre and became a leading light in society thanks to her friendship with Madame Tallien, who had helped to secure her release. With an eye to the political situation she was conscious of the need for a protector and her social standing allowed her to meet many candidates. One particularly caught her attention, an up and coming young general – Napoléon Bonaparte. When Joséphine married Napoléon Bonaparte in 1796, Hortense was just shy of her thirteenth birthday. Initially she and her brother were very reserved with respect to their mother’s new husband, but their reticence soon changed to unreserved admiration. Napoléon, for his part, was to act very affectionately towards them. It would turn out in time that his step-children were far more loyal to him than his own siblings. When she was seventeen, Hortense fell in love with Géraud Duroc, a senior aide to her step-father. She was tall and slender with blonde hair, large blue eyes, a heart-shaped face and fine features; unquestionably a beauty. 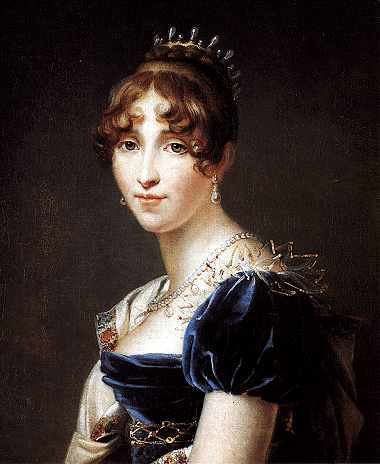 Napoleon would have allowed a marriage to Duroc, but Josephine, constantly mindful of a need to reinforce her position and her links to the Bonaparte family, had her sights set on a political marriage for her daughter and as a result of her scheming, Hortense was married to Louis Bonaparte on 4 January, 1802. 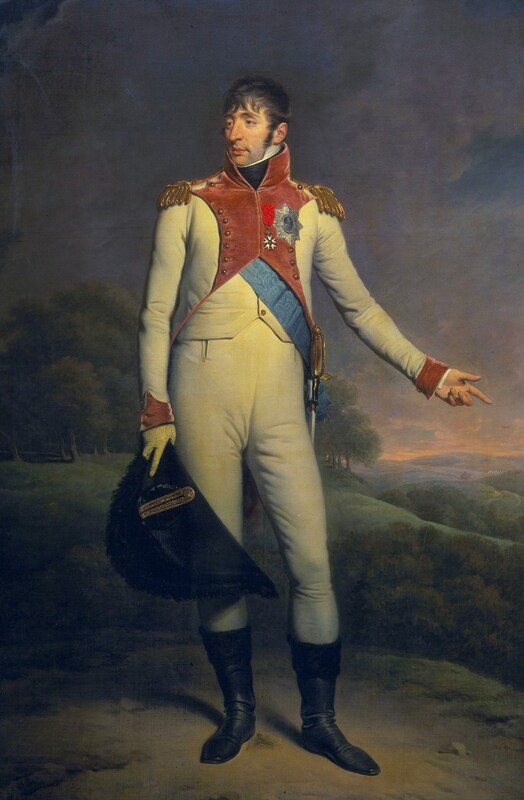 In 1806, Napoleon made his brother the King of Holland, and Hortense reluctantly accompanied her husband to The Hague. Though she was pleasantly surprised by the warm welcome she received from the public, she hated her stay there because of her bad, and deteriorating, relationship with Louis. She took up water colour painting and was an accomplished amateur musical composer, supplying the army with rousing marches, including Partant pour la Syrie. She also enjoyed playing games and was even better at billiards than her mother. When her son died in 1807, Hortense returned to Paris. This tacit separation suited Hortense, and she therefore refused the divorce that Louis wanted, caring little for her own titles and position in the court but looking to her children’s future, a characteristic she had obviously inherited from her mother. When the marriage of Joséphine and Napoléon came to its inevitable sad end in January 1810, Hortense was on hand to offer support to her devastated mother. Though, both she and her brother made it clear to their stepfather that they would never cease to care about him. Perhaps that was some comfort to him too as he had grown to genuinely love his stepchildren over the years and they never let him down unlike his own family. A few months later, when his Dutch kingdom was taken away from him, Louis remained in Holland, turning to writing and poetry. This left Hortense free to respond to the romantic overtures of the man whom she had long admired, Colonel Charles Joseph, Comte de Flahaut. He was a sophisticated, handsome man rumoured to be the illegitimate son of Talleyrand. They soon became lovers and, early in 1811 Hortense realised she was pregnant again. Confessing all to Eugène and trusting in the loyalty of her household, she went to Switzerland where she gave birth to a son, Charles Auguste Louis Joseph ( 21 October 1811 – 10 March 1865). The success of the expedition reveals how much Hortense was able to trust her entourage. She had used poor health to explain her prolonged visit to Switzerland, the journey having been arranged by Adélaïde, mother of de Flahaut. Hortense cleverly disguised her pregnancy (she was, by then, in her sixth month), during the baptism of Napoleon’s son, Napoleon II when she was chosen to be one of the child’s godmothers, an honour she shared with Madame Mère, mother of the Emperor. During the first Bourbon Restoration of 1814, Hortense had bewitched Tsar Alexander I with her famous charm and. Keen to show his appreciation for the lovely Hortense, Alexander had encouraged the incoming Louis XVIII to show her some favour and give her the title of Duchesse de St Leu. 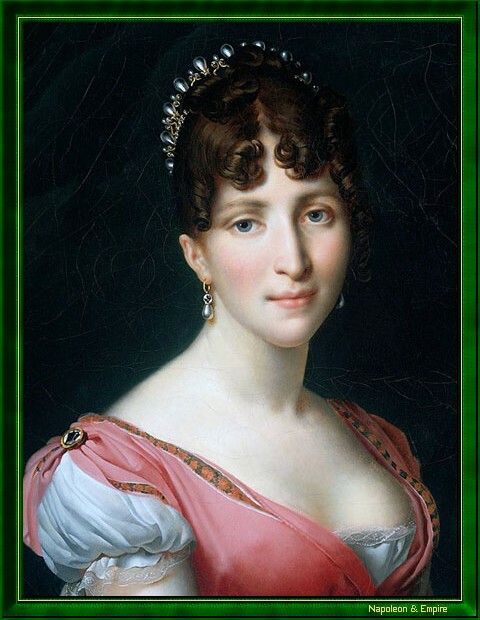 During the Hundred Days, however, Hortense supported her stepfather and brother-in-law Napoleon. This led to her banishment from France after his final defeat. She traveled in Germany and Italy before purchasing the Château of Arenenberg in the Swiss canton of Thurgau in 1817. Arenenberg became the centre of a small court, a new Malmaison where, accompanied by faithful retainers, Hortense sang, painted and charmed her guests, from Madame Récamier to Alexandre Dumas. In 1837, Hortense then fell ill when her surviving son, Louis-Napoléon, was in the USA. He returned to Arenenberg just in time for his mother to die in his arms on 5 October at the age of fifty-four. She is buried next to her mother Joséphine in the Saint-Pierre-Saint-Paul church in Rueil-Malmaison. Her husband, Louis Bonaparte survived her by nine years, eventually dying in July 1846. 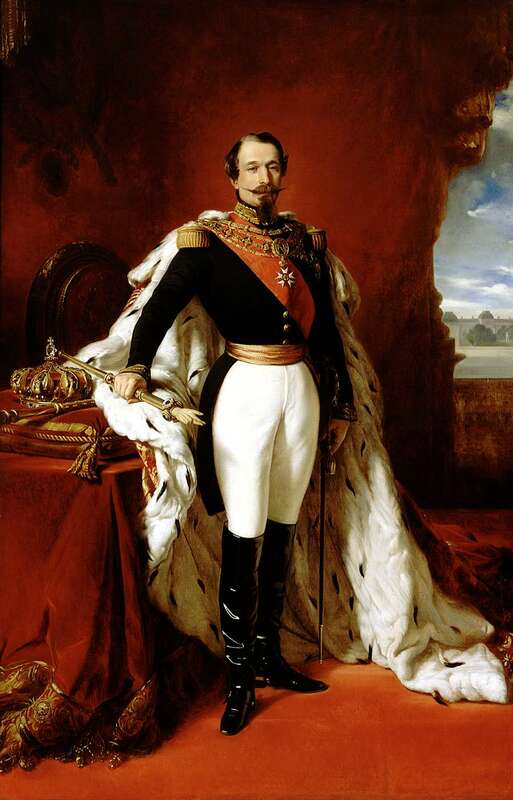 Their youngest son would become Napoleon III in 1852. He in turn would make his half-brother, the son of Hortense and de Flahaut, the Duke of Morny.